If there was an elected president of muscle-building meals, it is no doubt that the post-workout meal would garner the vast majority of the votes from the populous. Indeed, post-workout nutrition is important for growth and recovery, but it is also important to keep it in context. Without proper nutrition throughout the rest of the day, a proper post-workout meal cannot offset suboptimal meals at other times of the day. Here’s an overview of how to manage your macros for one of the other most important meals of the day – pre-workout. We all know that protein is the most critical macronutrient for stimulating muscle protein synthesis.1 Increasing muscle protein synthesis is crucial to new muscle gain and proper recovery from a workout. Some studies have demonstrated that net protein balance becomes negative from an intense workout. Most of these studies examined exercise in the fasted state. Consuming a meal to optimize the rate of protein synthesis before a workout could theoretically attenuate the shift to a net negative balance. So the logical question is, “How much protein?” Based on the available data we have, it seems that the amount of protein required to maximize muscle protein synthesis will depend upon its leucine content.2 Various protein sources have different leucine contents, but it seems that around 0.015 grams per pound of leucine will max-out protein synthesis at a meal. So in a 200-pound person, this would correspond to 3 grams of leucine. That would be equivalent to about 30-40 grams of protein for most protein sources. For a protein source like whey, it would only require about 25-30 grams of protein since it has a very high leucine content. 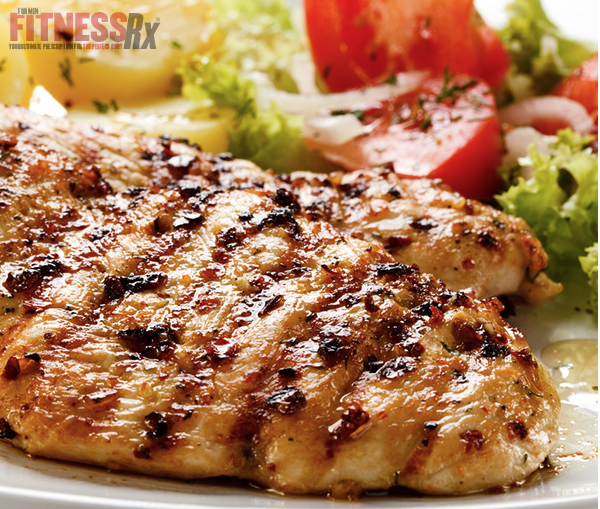 Something like chicken or beef would be closer to 35-40 grams of protein. Shakes may be beneficial for people who experience gastrointestinal (GI) distress during workouts, but whole foods are probably also fine for those who don’t. Carbohydrates are probably the most controversial macronutrient in terms of recommendations and with good reason— everyone tolerates them very differently. I have worked with bodybuilders who could eat 800 grams of carbs per day and just maintain their weight, and I’ve met others who put on fat like a bear about to go into hibernation from anything over 200 grams of carbs. So there is a wide range of carbohydrates that encapsulate what may be optimal for your daily intake. For years it was theorized that you needed a large dose (75-100 grams) of a simple carbohydrate like dextrose in order to maximize muscle protein synthesis and muscle glycogen content. However, carbohydrates in and of themselves are not anabolic as they do not increase protein synthesis by themselves in adults.1 Carbohydrates may, however, have synergistic effects on protein synthesis when combined with protein.3 Carbohydrates may also improve performance by sparing muscle glycogen.4 Again, the question becomes how much is optimal? One study suggests that far less carbohydrate may be required to maximize the protein synthetic response when combined with amino acids/protein than previously thought.5 These researchers gave a large dose of amino acids plus either 30 grams or 90 grams of glucose, and measured rates of muscle protein synthesis. They found that both treatments maximized the anabolic response in the muscle. 1) If you are consuming a greater percentage of your carb intake pre-workout, it might be wise to lower fat proportionately in order to keep overall caloric load down, especially if you are dieting. 2) High-fat meals have actually been shown to also reduce testosterone release.7 While it is debatable how important short-term fluctuations in testosterone are, it is certainly something to consider. 3) Fat slows gastric emptying, and that might cause GI distress during the workout. While less glorified than the post-workout meal, pre-workout nutrition obviously is very important for maximizing the anabolic effect of a training session. I suggest eating a pre-workout meal with adequate protein and carbs to maximize anabolism while keeping fat a bit lower, anywhere from 1-2.5 hours before a workout to maximize your performance and anabolic response. Gautsch TA, Anthony JC, Kimball SR, et al. Am J Physiol 1999;274: C406-C414. Optimal protein intake to maximize muscle protein synthesis: Agro Food Ind. High-Tech. 2009 Mar/Apr;20(2):54-57. Beelen M, Koopman R, Gijsen AP, et al. Am J Physiol Endocrinol Metab 2008;Jul;295(1):E70-7. Haff GG, Lehmkuhl MJ, McCoy LB, Stone MH. J Strength Cond Res. 2003 Feb;17(1):187-96. Glynn EL, Fry CS, Drummond MJ, et al. Am J Physiol Regul Integr Comp Physiol;2010 Aug;299(2):R533-40. Brooks GA. Hormone and Metabolic Research (in press). January 2010. 7. Meikle AW, Stringham JD, Woodward MG, McMurry MP. Metabolism 1990;Sep;39(9):943-6.